What is Allermyl medicated shampoo? Allermyl shampoo cleanses the skin and is recommended as essential complementary care during treatment of allergic dermatitis (skin allergies, especially atopy) in dogs and cats. Skin allergies can cause pruritus (itching), inflammation (red, irritated skin), skin structural defects (skin micro-lesions) and secondary microbial blooms. 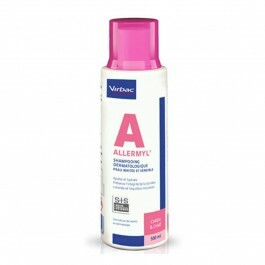 Allermyl is gentle enough to cleanse without causing any further irritation or damage. What are the properties of Allermyl medicated shampoo? What is in Allermyl medicated shampoo? Gentle washing bases, monosaccharides / poly alkyl glucosides (Virbac Glycotechnology), complex skin lipids (ceramides, fatty acids, cholesterol), AGE (omega-6), piroctone olamine. Physiological pH. How do I use Allermyl medicated shampoo? Apply the amount recommended by your veterinarian with the measuring cup. Shampoo the coat, rinse with warm water and repeat, leaving the second application on the coat for 5 minutes minimum before rinsing with warm water. Please Note:This shampoo should be used on recommendation from your veterinary surgeon - Use as advised by your vet. Two to three applications per week may be necessary. Is there any further advice I should know about Allermyl medicated shampoo? Formulated to minimize the risk of skin reactions. Avoid prolonged exposure to temperatures above 30 ° C.